Scientists at The Scripps Research Institute (TSRI) have found a way to apply a powerful new DNA-editing technology more broadly than ever before. “This is one of the hottest tools in biology, and we’ve now found a way to target it to any DNA sequence,” said Dr. Carlos F. Barbas III, the Janet and Keith Kellogg II Chair in Molecular Biology and Professor in the Department of Chemistry at TSRI. The breakthrough concerns a set of designer DNA-binding proteins called TALEs, which biologists increasingly use to turn on, turn off, delete, insert, or even rewrite specific genes within cells—for scientific experiments and also for potential biotech and medical applications, including treatments for genetic diseases. TALE-based methods had been considered useful against only a fraction of the possible DNA sequences found in animals and plants, but the new finding removes that limitation. Dr. Barbas and his team reported their finding on August 26, 2013 in an advance online edition of the journal Nucleic Acids Research. Molecular biologists have long dreamt of being able to manipulate DNA in living cells with ease and precision, and by now that dream is nearly a reality. TALE-based designer proteins, introduced just a few years ago, are arguably the most user-friendly and precise DNA-directed tools that have yet been invented. Designer TALEs (transcription-activator-like effectors) are based on natural TALE proteins that are produced by some plant-infecting bacteria. These natural TALEs help bacteria subvert their plant hosts by binding to specific sites on plant DNA and boosting the activity of certain genes—thereby enhancing the growth and survival of the invading bacteria. Scientists have found that they can easily engineer the DNA-grabbing segment of TALE proteins to bind precisely to a DNA sequence of interest. Dr. Jan-Michael Peters and his team at the Research Institute of Molecular Pathology (IMP) in Vienna, Austria, have found that the structure of chromosomes is supported by a kind of molecular skeleton, made of cohesin. This discovery was reported online on August 25, 2013 in Nature. Every single cell in the human body contains an entire copy of the genetic blueprint, the DNA. Its total length is about 3.5 meters and all of it has to fit into the cell’s nucleus, just one-hundredth of a millimeter in diameter. Blown up in proportion, this would equal the task of squeezing a 150-km-long string into a soccer ball. Just how the cell manages to wrap up its DNA so tightly is still poorly understood. One way of compacting DNA is achieved by coiling it tightly around histone proteins. This mechanism has been studied in detail and is the focus of an entire discipline, epigenetics. However, simple organisms such as bacteria have to manage their DNA packaging without histones, and even in human cells, histones probably cannot do the job on their own. In its Nature article, Dr. Peters’ IMP research team in Vienna presents evidence for an additional mechanism involved in structuring DNA. IMP Managing Director Dr. Peters and his research group discovered that a protein complex named cohesin has a stabilizing effect on DNA. In evolutionary terms, cohesin is very old and its structure has hardly changed over billions of years. It was present long before histones and might therefore provide an ancient mechanism in shaping DNA. Cell biologists are already familiar with cohesin and its role in cell division. The protein complex is essential for the correct distribution of chromosomes to daughter cells. When Francis Crick and James Watson discovered the double-helical structure of deoxyribonucleic acid (DNA) in 1953, their findings began a genetic revolution to map, study, and sequence the building blocks of living organisms. 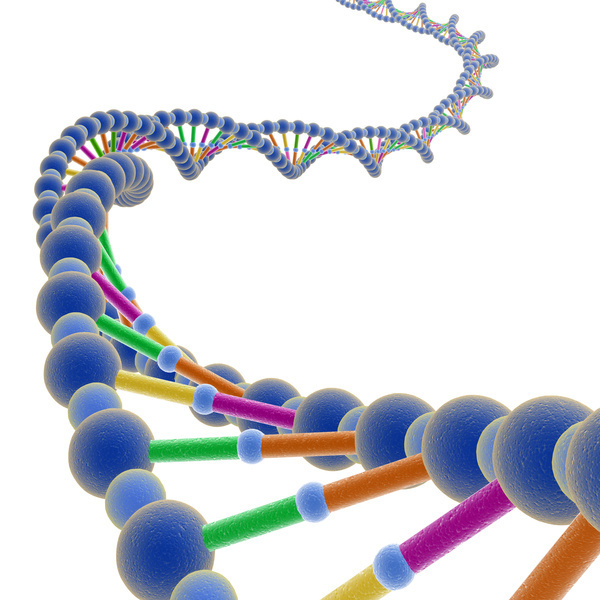 DNA encodes the genetic material passed on from generation to generation. For the information encoded in the DNA to be made into the proteins and enzymes necessary for life, ribonucleic acid (RNA), single-stranded genetic material found in the ribosomes of cells, serves as intermediary. Although usually single-stranded, some RNA sequences have the ability to form a double helix, much like DNA. In 1961, Alexander Rich along with David Davies, Watson, and Crick, hypothesized that the RNA known as poly (rA) could form a parallel-stranded double helix. Some fifty years later now, scientists from McGill University have successfully crystallized a short RNA sequence, poly (rA)11, and used data collected at the Canadian Light Source (CLS) and the Cornell High Energy Synchrotron to confirm the hypothesis of a poly (rA) double helix. The detailed 3D structure of poly (rA)11 was published by the laboratory of McGill Biochemistry professor Dr. Kalle Gehring, in collaboration with Dr. George Sheldrick, University of Göttingen, and Dr. Christopher Wilds, Concordia University. Dr. Wilds and Dr. Gehring are members of the Quebec structural biology association GRASP. The paper was published online on June 27, 2013 in the journal Angewandte Chemie International Edition. “After 50 years of study, the identification of a novel nucleic acid structure is very rare. So when we came across the unusual crystals of poly (rA), we jumped on it,” said Dr. Gehring, who also directs the McGill Bionanomachines training program. Dr. Findings from postmortem studies of the brains of Huntington's disease (HD) patients suggest that transcriptional dysregulation may be an early step in the pathogenesis of HD before symptoms appear. Other studies report transcriptional alterations in the brains of some mouse models of HD. A new study has found transcriptional changes in mouse striatum which correlate with progressive motor and psychiatric deficits and, most importantly, reports for the first time, that an antisense oligonucleotide (ASO) may be used therapeutically to both correct striatal transcriptional abnormalities and improve motor and behavioral problems. The article is published in the latest issue of the Journal of Huntington's Disease (Volume 2, Number 2, 2013). "Down-regulation of the expression of key molecules at the mRNA level could well be one of the underlying mechanisms leading to neuronal dysfunction in HD," says Lisa M. Stanek, Ph.D., of Genzyme Corporation's Rare Disease Unit, Framingham, Massachusetts. "The data presented here provide strong evidence that transcriptional correction has great potential as a novel therapeutic biomarker for HD." HD is an inherited progressive neurological disorder for which there is presently no cure. 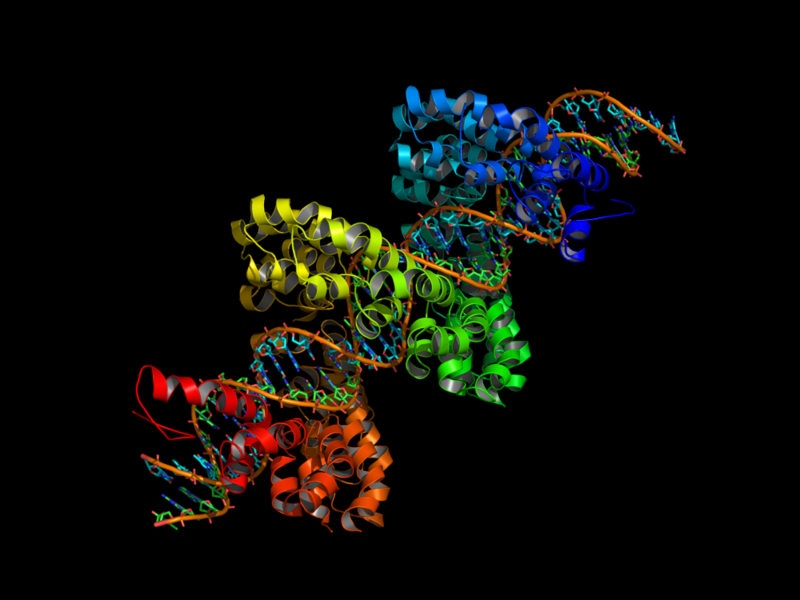 It is caused by a dominant mutation in the HD gene leading to expression of mutant huntingtin (HTT) protein (image shows structure of HTT protein). Expression of mutant HTT causes subtle changes in cellular functions, which ultimately results in jerking, uncontrollable movements, progressive psychiatric difficulties, and loss of mental abilities. The current study focuses on what is happening early in the disease process before symptoms or even neuropathological changes are apparent. The authors believe that mutant HTT may be disrupting normal transcriptional processes in susceptible neurons. A study in mice reveals an elegant circuit within the developing visual system that helps dictate how the eyes connect to the brain. The research, funded by the National Institutes of Health, has implications for treating amblyopia (also known as “lazy eye”), a vision disorder that occurs when the brain ignores one eye in favor of the other. Amblyopia is the most common cause of visual impairment in childhood, and can occur whenever there is a misalignment between what the two eyes see—for example, if one eye is clouded by a cataract or if the eyes are positioned at different angles. The brain at first has a slight preference for the more functional eye, and over time—as that eye continues to send the brain useful information—the brain's preference for that eye gets stronger at the expense of the other eye. Patching the strong eye can help correct amblyopia. But if the condition isn't caught and corrected during childhood, visual impairment in the weaker eye is likely to persist into adulthood. "Our study identifies a mechanism for visual development in the young brain and shows that it's possible to turn on the same mechanism in the adult brain, thus offering hope for treating older children and adults with amblyopia," said Joshua Trachtenberg, Ph.D., an associate professor of neurobiology at the David Geffen School of Medicine, University of California, Los Angeles (UCLA). The study was published online on August 25, 2013 in Nature. Within the brain, cells in a limited region called the binocular zone can receive input from both eyes. During brain development, the eyes compete to connect within this zone, and sometimes one eye prevails—a process known as ocular dominance. Ocular dominance is a normal process and is an example of the brain's ability to adapt based on experience—called plasticity. But it can also set the stage for amblyopia. Concealed within the vastness of the human genome, (comprised of some 3 billion base pairs), mutations are commonplace. While the majority of these appear to have a neutral effect on human health, many others are associated with diseases and disease susceptibility. Dr. Reed Cartwright, a researcher at Arizona State University's Biodesign Institute, along with colleagues at ASU, Washington University, and the Wellcome Trust Sanger Institute, Cambridge, UK, report on a new software tool known as DeNovoGear, which uses statistical probabilities to help identify mutations and more accurately pinpoint their source and their possible significance for health. Improvements in the accuracy of mutation identification and validation could have a profound impact on the diagnosis and treatment of mutation-related diseases. "These techniques are being considered in two different realms," Dr. Cartwright says. "The first is for pediatric diseases." Here, a child with an unusual genetic disease may undergo genomic sequencing to see if the mutations observed have been acquired from the parents or are instead, unique to the child. "We can identify these mutations and try to detect which gene may be broken," he says. The second application is for cancer research, where tumor tissues are genetically compared with normal tissue. Many now believe that the identification of a specific cancer mutation may eventually permit clinicians to customize a treatment for that tissue type. "We are developing methods to allow researchers to make those types of analyses, using advanced, probabilistic methods," Dr. Cartwright says. "We actually model the whole process." Indeed, the method described provides the first model-based approach for ferreting out certain types of mutations. The group's research results were published online on August 25, 2013 in Nature Methods. A new genome-wide association study (GWAS) estimates the number of different places in the human genome that are involved in schizophrenia. In particular, the study identifies 22 locations, including 13 that are newly discovered, that are believed to play a role in causing schizophrenia. "If finding the causes of schizophrenia is like solving a jigsaw puzzle, then these new results give us the corners and some of the pieces on the edges," said study lead author Patrick F. Sullivan, M.D. "We've debated this for a century, and we are now zeroing in on answers. This study gives us the clearest picture to date of two different pathways that might be going wrong in people with schizophrenia. Now we need to concentrate our research very urgently on these two pathways in our quest to understand what causes this disabling mental illness." Dr. Sullivan is a professor in the departments of Genetics and Psychiatry and director of the Center for Psychiatric Genomics at the University of North Carolina School of Medicine. The new study was published online on August 25, 2013 in Nature Genetics. The results are based on a multi-stage analysis that began with a Swedish national sample of 5,001 schizophrenia cases and 6,243 controls, followed by a meta analysis of previous GWAS studies, and finally by replication of single nucleotide polymorphisms (SNPs) in 168 genomic regions in independent samples. The total number of people in the study was more than 59,000. One of the two pathways identified by the study, Dr. Sullivan said, is a calcium channel pathway. This pathway includes the genes CACNA1C and CACNB2, whose proteins touch each other as part of an important process in nerve cells. The other pathway is the "micro-RNA 137" pathway. A statistical model accounting for dozens of different genes in combination—and the interactions between them—is an important step forward in understanding the genetic factors affecting the risk of Crohn's disease (CD), reports a study in Inflammatory Bowel Diseases, official journal of the Crohn's & Colitis Foundation of America (CCFA). It's not just how many risk genes are present, but how those genes interact with each other that determines the inheritance of CD risk, suggests the report by a research group from the Cleveland Clinic and the University of Pittsburgh. The study is the first to show that information on genetic interactions can improve the ability to predict CD risk and explain its genetic heritability. CD is a chronic inflammatory bowel disease affecting up to 700,000 Americans. Although the exact cause is unknown, CD appears to result from an "inappropriate persistent immune response." In addition to genetics, microbial and environmental factors likely play important roles in the development of CD. Using modern genetic research methods, called genome-wide association studies (GWAS), researchers have identified at least 71 genes that appear to affect CD risk. However, individual genes have only small effects on CD risk. Even after accounting for the combined effects of CD risk genes, less than one-fourth of CD heritability can be explained. To address this issue, the researchers developed a new model exploring "higher-order genetic interactions" among known CD risk genes. The model was designed to evaluate not only the additive effects of having multiple CD risk genes, but also the possible impact of interactions between genes. A new study has revealed marked differences in the genomic terrain of the two most common types of cervical cancer, suggesting that patients might benefit from therapies geared to each type’s molecular idiosyncrasies. The study, published August 23, 2013 in the online version of the journal Cancer by researchers at Dana-Farber Cancer Institute and Brigham and Women’s Hospital (BWH) in Boston, is the first to compare the spectrum of cancer-related gene mutations in the two main subtypes of cervical cancer – adenocarcinoma and squamous cell carcinoma. In tests on 80 cervical tumor samples, the investigators found high rates of mutations in two genes: PIK3CA and KRAS. While PIK3CA mutations appeared in both subtypes, KRAS mutations were found only in adenocarcinomas. By linking their findings to data on patients’ treatment and survival, researchers found that PIK3CA mutations are associated with a shorter survival period: patients whose tumors carried these mutations lived a median of 67 months after diagnosis compared with 90 months for patients whose tumors lacked the mutations. “We have historically treated cervical cancers as one disease,” says the study’s lead author, Alexi Wright, M.D., M.P.H., of the Susan F. Smith Center for Women’s Cancers at Dana-Farber. “However, our findings suggest that some patients may be at higher risk of dying from their disease and might benefit from a more tailored treatment approach.” The discovery of high rates of PIK3CA mutations in the cervical tumor samples suggests that many patients could benefit from drugs known as PI3-kinase inhibitors, which target the family of proteins associated with the gene, the authors say.